If we will reduce the extinction rates of organisms, the radiation of generalist organisms and, further their speciation rates will get reduced too, because of unavailability of empty niches. So, conservation of all endangered species is not necessary. It blocks evolution of new life forms. For example, if an ET had conserved dinosaurs, we could not have come to existence. So, President Trump is a great visionary. I know it's never enough, but we have made great gains in protecting endangered species compared to 40 years ago. We will continue to lose species every year, but some of the success stories are worth celebrating. I seriously said what I said. You took it as a sarcasm. Do you think the logic i gave for discretion in conservation efforts is wrong? How? We deliberately eradicated the small pox viruses, but have kept details of their genomes. So why should we try to conserve all the unnecessary organisms? l mean, even those whose role in maintaining the balance of nature either does not exist any more, or, can be done in a more energy efficient way by some human invention. It will be a complicated task to decide on the pros and cons, but we can weigh the benefits versus risks. Leaving our dependence on natural habitats. Ultimately nature kills the organism. We need freedom from plants to capture energy for us. We need freedom to decide our evolutionary fates. We need freedom from Earth and the Sun, also freedom from space time and matter. Because they are temporary. All protons and ultimately even the photons are going to disappear. We will be completely civilized only when these entities are no more required for our continued existence. Civilized Life Forms are no more in the universe. maunas wrote: We need freedom to decide our evolutionary fates. Evolution does not work like that. Species split and evolve to match the environment. If you can't predict the future environment you can't pick and choose what way you should evolve. maunas wrote: We need freedom from Earth and the Sun, also freedom from space time and matter. Because they are temporary. And how is DNA going to allow for evolution if there is no matter? There won't be any DNA. maunas wrote: We will be completely civilized only when these entities are no more required for our continued existence. What is this new civilisation going to do when there is no time or matter? Not build beautiful buildings? Not paint great art? It would be the most boring civilisation of all time. We will able to convert ourselves into new forms of matter with novel types of pains and pleasures. Feel the novel entities and our creations by taking any form in them. We will be able to teach the new forms to become civilized like us. We will reproduce in this manner. We can enjoy each others creations by taking any forms in them, sort of intercourses with eachother, and thus be in a state of continuos joy. Even in states of grief we will be feeling a strange pleasure. I think, Maunas, that your speculation about new forms of matter is going a bit too far. Since we do not know if such forms are even possible according to the laws of physics, we need to keep our feet a bit more firmly on the ground. I do think, though, that humans will one day take their own evolution under control, by using whatever form of genetic engineering is best at the time. I'm skeptical that we can teach others to be civilized. We haven't had much success so far, if history is the judge. Sorry landrew, but that is just a popular fallacy. If we look at violence, we have become very substantially more civilised. In the English era of around William the Conqueror, the murder rate was 80 killings per 100,000 people per year. Today, in the relatively violent USA, it is 5 killings. In more civilised England, it is only 1 killing. We will be free from laws of physics, Lance. We will create new laws. Our creations will be our parts, Landrew. We will be teaching ourselves. In many forms if we decide, in diverse ways as we please. Even though there are a billion trillion stars in the observable universe, they are actually extremely rare. What or who is the rest ?? Does this What or Who follow the laws of physics? maunas wrote: We will able to convert ourselves into new forms of matter with novel types of pains and pleasures. "Converting ourselves" is not evolution. (Oddly this concept was heavily discussed in an episode of the UK TV series, "Dr Who" in "Genesis of the Daleks" where a humanoid race decided to speed their evolution into being the Daleks......who promptly killed off their creators. maunas wrote: We will be able to teach the new forms to become civilized like us. Sounds like colonial England 400 years ago. The absurd is the essential concept and the first truth. Universe is Weird. I marvel that people actually post stuff like this.........I mean.....we aren't a target audience for $$$$$.....so, its all ego? Ha, ha.....I don't want to see it....but imagine two of the same talking to one another. To "DO" what I wonder? Evolution by natural selection is a prison, where we wait to be hanged to death. We are freeing ourselves from nature. It seems you have not been following the discussions. A prison for you and I and all homo sapiens? You are proposing a future home for an unknown species, we will never meet? maunas wrote: where we wait to be hanged to death. Maunus. I have a seven month old boy. He will speak French, English, German, and hopefully Russian.. I am not asking him to learn to kill his own species off yet. Are you? maunas wrote: It seems you have not been following the discussions. You don't have children do you? Goodbye to your genes. .
Tell you, I am not managed by genes. I am no more as much animal as other Homo sapiens. And I am evolving towards my goal than anybody else (in my knowledge) towards my goal. And that too in the same body. Raising mutants in your basement? 1) meme's, are like what I had called Euthenes. I have described about euthenical evolution in man under the topic, " Racism". It's on page no: 12 in that topic. 2) Modifying and managing our genomic and extra genomic activity by medical science. Last edited by maunas on Wed Dec 19, 2018 10:06 am, edited 1 time in total. maunas wrote: 2) Modifying and managing our genomic and extra genomic activity by medical science. Evolution is about mutation and natural selection adapting a species to the environment. As you cannot predict future environments you cannot pick and choose what new genes you want to add or dump. As 90% of our genes don't do anything other than allow for phenotype alternatives if the environment changes, you are being silly to eradicate genes that you don't understand. 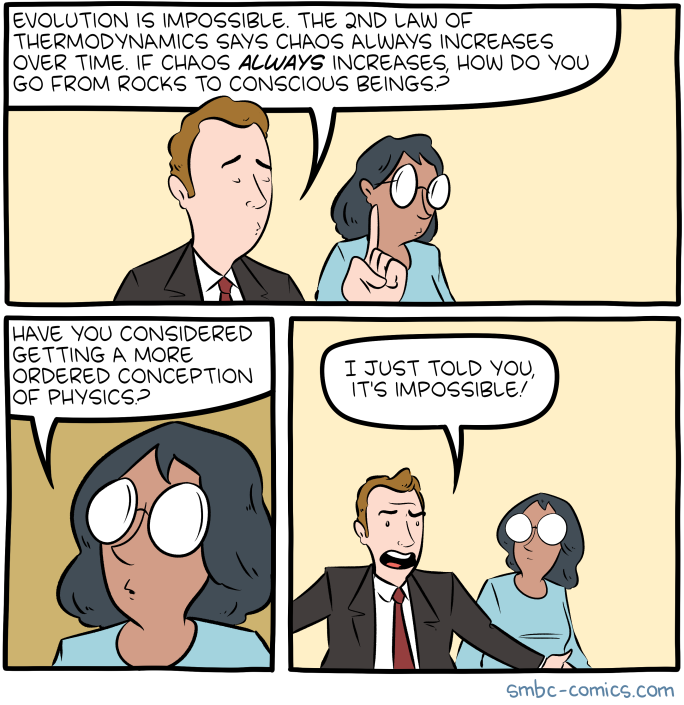 Secondly, as you claim humans will no longer need matter (normal physics) in the future, it seems odd that you choose a method of evolution that specifically requires matter (normal physics). Genetic and epigenetic engineering is possible. Also environmental engineering, such as reducing the excessive co2 content of the atmosphere, healing the gaping hole in the ozone layer. For freewilled laws of physics and novel kinds of matter, humanity is not yet mature. If you can extend your age then you will one day see it. We are very capable of predicting future environment. We carry our environment when we go into extreme environments, such as, in Antarctica, Space, moon and deep sea etc. We have inventions to keep our bodies at optimum temperature in extreme weathers, for which we don't have specific genetic evolution through natural selection. Our genes and our natural environment, both are being managed by us. maunas wrote: Our genes and our natural environment, both are being managed by us. Tell that to cancer patients. Are you aware that you seem to make a lot of unqualified and sweeping comments? 1) Most of the cancer causing genes will not be deleted if we depend on natural selection, for a variety of reasons. The most important being that, most of the patients are able to reproduce before the disease is diagnosed in them (and many even after that too). 2) Hitlerian artificial selection is unacceptable by humans. 3) Most of the technology for managing our genes and environment exists, but, much of it is in labs only. Some of it is in theory possible. 4) What is required are funds, and efforts at a war footing to make it within the reach of general population. 5) The funds and manpower for doing this is being consumed by human military establishments. 6) We, the people of the world, only need demilitarization of the world, for freeing the manpower and money involved in military to redirect it to it's more humanistic purposes. Last edited by maunas on Thu Dec 20, 2018 5:09 pm, edited 1 time in total. I do accept that sometimes I deliberately make unqualified comments to receive a response.